A Life of le Jazz Hot! Summary for the Busy Executive: The entertainer and the icon. Josephine Baker lived a fantastic, improbable life. From scratching and scrambling on the streets as an African-American child in St. Louis, she became a top entertainer in Paris and an emblem of the Jazz Age. Hemingway called her "the most sensational woman anyone ever saw." Although she made successful movies in France, including silents, her career centered on the stage revue. Known for her racy songs and revealing, outrageous costumes, she put the folies in the Folies Bergère and inspired the greatest poets, artists, and designers of the era – a topos of Art Deco and Cubism and a symbol of sexual liberation. She became a French citizen in 1937. During World War II and the Occupation, the Nazis were hesitant to touch her, even though she was Black and had married a Jew, such was her status in French culture. She became a courier for the Resistance at great personal risk, since the Resistance was notoriously full of informers. She carried messages wherever she toured, written with invisible ink in her sheet music or pinned to her underwear. She also passed along intelligence that she herself had gathered. After the war, she received both the Legion of Honor and the Croix de Guerre. She also became involved during the McCarthy era in the American Civil Rights movement. Her career was never as big in her native country as in France, although after the war she had American triumphs and had achieved legendary status. She refused to perform for segregated audiences and adopted twelve children of different nationalities, races, and religions. She performed magnificently until she died. How can you get such a phenomenon fully into music? You can't. To their considerable credit, the Imani Winds don't even presume. This quintet of superbly-trained classical musicians (four gorgeous women and one very lucky French horn player) have always nimbly crossed popular and classical lines, with albums of Ravel, Piazzolla, Richard Wernick, Paquito D'Rivera, Alvin Singleton, and Lalo Schifrin. Furthermore, they play as well as any wind ensemble around – jaw-droppingly well, in fact, with precipitous runs perfectly synchronized and a real sense of mastery and ease. 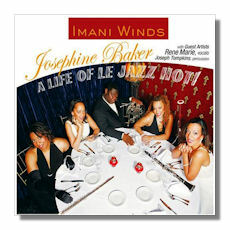 The disc consists of two suites – one by horn Jeff Scott and the other by flute Valerie Coleman – as well as of arrangements by Scott of three songs associated with Baker. Scott conceived of La belle sirène as incidental music to scenes from Baker's films and thus focuses on the entertainer. He emphasizes lightness of atmosphere, a Rene Clair Gallicism with pop overtones. On the other hand, Valerie Coleman's Portraits concentrates on scenes from the life. It's moodier and aims to evoke the essence of a situation. Both composers write well for the ensemble, although Scott writes more clearly than Coleman. Scott also seems more at home with jazz idioms. For example, the movement "Jazz Moozeecall" boldly evokes Ellington's "jungle music." Coleman strikes me as more classically oriented. Her "World War II," for instance, wouldn't have raised any inconsistency in most contemporary woodwind scores. They divide interest equally among the parts, although Coleman seems more retiring in regard to her own instrument than Scott does in regard to his. Both composers use percussion tastefully and even imaginatively. The ensemble does wonderfully with both. Vocalist Rene Marie has joyous, saucy fun with "Don't Touch My Tomatoes" and does a sterling job as a chanteuse in the other numbers. She's a name new to me, and this album makes a fine introduction to her work. Scott's arrangements increase the enjoyment. Percussionist Joseph Tompkins swings with elegance. Overall, a marvelous entertainment from beginning to end.